My purpose is for them to be not only lifelong learners, but creative innovators, collaborators, and confident world-improvers. Amen! I wish everyone would take this approach!!! Thank you, Oliver, for your quick response and comment! I liked thinking about the question and writing this post. I’ll try to pay more attention to your QinEds! I like to think of important questions, and often as a result it helps me make goals that transform my teaching. Adding on to Oliver’s comment, I love the idea of all children (and adults!) “using what they’ve learned to make the world a better place” in every location – school, home, work… Thank you for adding to the conversation, Denise! (I’m flattered you included a quote, too!) This was a tough question – I think we should ask students of different ages what they think the purpose of school is… to get them into the conversation, as well. Thanks for reading and adding a comment. 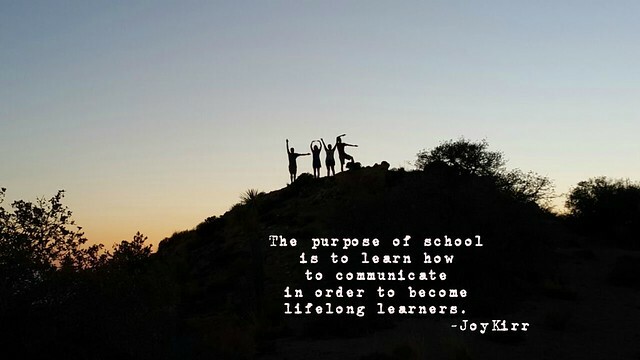 I love the idea of asking student what they think the purpose of school is. I’m asking my second graders this year. It will be fascinating to hear their answers. Hopefully I can learn something that helps me include them in my goals too. This is great. I love that you and Joy both took the time (already!) to blog about Oliver’s question. My goal is to write one today too! Looking forward to reading it, Gallit! It’s great to think about these important questions in education! Love your post Denise, I can really hear your voice. My favorite line is “the reason for all of my teaching is a bigger life lesson for them to learn.” Classrooms do represent real life in many ways as do schools. Classrooms represent towns in the way we all interact with each other and work at understanding one another. While schools represent states or countries. As always I take away many good things from your words. I like your metaphor of cities, states, and countries. I’m just reading Paul Solarz’s book Learn Like a Pirate. I’m excited to have new ways to help my second graders become a community this year.